Maureen Magarity led UNH to its first-ever American East Championship and a program-record 26 wins. Maureen Magarity grew up in a ‘basketball family’ and around a father who was a successful Division I Head Men’s Basketball Coach, but that has not stopped her from creating her own legacy as both a player and coach. A wife and mother to two young daughters, Charlotte (5) and Caroline (2), she is doing so while never forgetting the importance of family. Magarity grew up in Poughkeepsie, NY where her father, Dave was the Head Men’s Basketball Coach at Marist College from 1986 to 2004. She feels her parents did an amazing job of putting the children first, which led to some of her favorite childhood memories of road trips with the team or when the team would come over to their house for holidays. While her father was leading Marist to over 250 wins during his tenure, Maureen learned just as much off the court from her mother, Rita. “My mother is the rock of the family and I learned so much from her now that I have my own girls. It’s so important to keep things in perspective and to always put your family first, whether you are having a winning season or a losing season. Your kids don’t care how many games you win, they want to have your attention and be included,” said Magarity. After playing for a season at Boston College, Magarity would return to Poughkeepsie to play at the school her father coached, Marist. During her three seasons at Marist, she would be a two-time MAAC All-Conference Team selection and lead the program to its first NCAA Tournament berth in 2004. Following graduation, it was a natural transition into coaching for Magarity. After a season of coaching at both Marist and Fairfield, Magarity became an Assistant Coach at Army under her father, who was now the Head Women’s Basketball Coach. In 2010, Magarity was offered an opportunity to lead her own Division I program at the University of New Hampshire. She was tasked with rebuilding a program that had not won more than nine games during each of the previous four seasons prior to her arrival and created a positive mindset as soon as she stepped on campus. In 2016-17, Magarity’s hard work paid off, as she led the program to its first American East Regular Season Championship, as well as a program-record 26 overall and 15 America East Conference wins. This on-court success resulted in her being named the conference’s Coach of the Year. This rebuild did not happen overnight though. 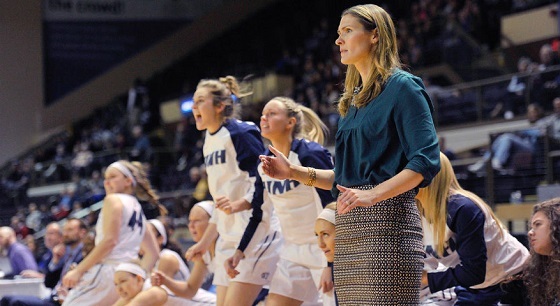 Magarity has learned a lot during her eight seasons as the Head Coach at New Hampshire, which she is willing to pass on to other coaches looking to achieve a coveted Division I Head Coach position. Magarity has made an impact on numerous lives throughout her career, all while emphasizing the approach that she grew up learning from her parents, family first.